Our rotary lobe pumps are designed for low, medium and high-viscosity media and offer gentle pumping action and reliable performance. 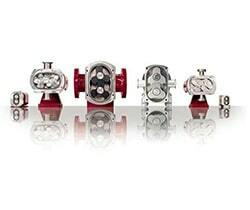 With its robust construction, each pump is developed for a different type of demand and meets high standards of quality and reliability. Collectively, they provide operating economy and high flexibility of use. The S Series is a core rotary lobe pump for the gentle handling of sensitive process fluids and features a smooth, low-shear pumping action. The X Series is our premium rotary lobe pump designed for gentle transportation of process fluids in hygienic and ultra-clean applications. The L Series is an optimized rotary lobe pump that is a cost-effective alternative to Alfa Laval S and X rotary lobe pumps. N Series stainless steel rotary lobe pumps have been designed for low volume fluid transfer duties within application areas such as laboratories, pilot plants, chemical processing, food processing, electroplating and film processing. D Series pumps cover a wide span of sludge transfer duties throughout the environmental and industrial waste treatment processes.